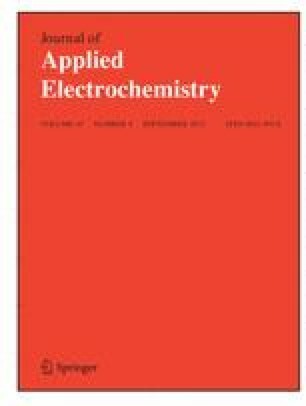 The electrochemical deposition and dissolution of aluminium on glassy carbon, platinum and gold electrodes in chloraluminate melts have been investigated using linear sweep voltammetry and potentiostatic pulse techniques. It was shown that deposition of aluminium on the glassy carbon electrode at low overpotentials takes place by 3-D progressive nucleation and growth, with the incorporation of atoms in the crystal lattice as the rate-determining step. At overpotentials higher than −100 mV vs Al, in the melts containing more than 52 mol % of AlCl3, diffusion of Al2Cl 7 − , takes over the control of deposition of aluminium. Alloying of platinum and gold electrodes with aluminium from the melt occurs in the underpotential region.